On December 5, 2017, many residents spoke to Mayor Bowman and his Executive Policy Committee about the need for recreation in South Winnipeg. On multiple times, Mayor Bowman said impact fees could ‘possibly’ go towards funding a recreation center. It’s important to note that South Winnipeg residents are the most heavily taxed citizens in all of Winnipeg. According to the City of Winnipeg’s Assessment and Taxation Branch, $28,588,657 in city taxes was raised in 2017 alone by residential properties in the catchment area defined as South of Bishop Grandin, North of the Perimeter Highway, East of Brady Road, and West of the Red River (exact area as the South Winnipeg Community Centre catchment area). These numbers do not include any education related taxes. In Winnipeg, 5.4% of each homeowner’s city taxes is allocated specifically towards RECREATION*. For details, see Tax Supported Services (Page 188 of Community Trends and Performance Report for 2018 Budget). 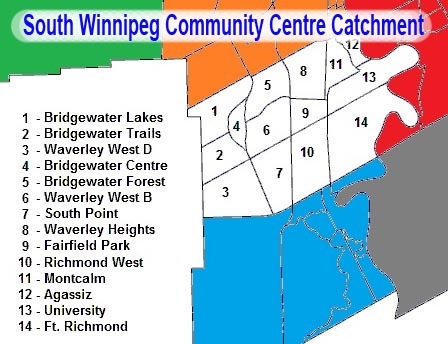 This means that residents in the South Winnipeg Community Centre CATCHMENT AREA paid $1,543,785 in city taxes in 2017 towards recreation services. Did we see this invested in our community? The Richmond Kings Community Center and Waverley Heights Community Centers which currently service the area were built many years ago in the 1970s. I’m confident in saying that residents in this catchment have been paying millions of dollars in taxes over multiple decades, and have not seen their portion of recreation taxes invested back into recreation facilities in their community. Impact fees could assist BUT clearly there are millions being generated for recreation year after year after year that are going outside of the community. “Recreation” includes City delivered aquatic programs (public swim, learn to swim); Leisure Guide recreation programs delivered through City owned facilities, community centres and schools; free programming; learn to skate programs; as well facility use and rentals (fitness equipment, room rentals and ice rentals). “Recreation” also includes support to community centres (through Universal Funding Formula grants) and General Council of Winnipeg Community Centres, as well as grants to community partner organizations to assist with community recreation and development.